Many negligence lawsuits involve the well-known legal test of “but for”. “But for” the negligence of another individual the accident would not have happened. “But for” the negligence of another individual I would not have been injured. However, in the context of a car accident the defence of “inevitable accident” or “Act of God” may be used by the lawyer representing the alleged negligent individual. Inevitable accidents are not caused by the negligence of any one person but rather are accidents that could not be prevented by reasonable care or caution. They are accidents that are caused by factors beyond the control of anyone. As a result, no one is at fault for the accident. An example of a defence of “inevitable accident” that has succeeded in the past involves a situation where an individual experiences a medical episode, such as a heart attack, that leads to a motor vehicle accident. If it can be proven that the individual who suffered from the heart attack had no forewarning of its onset, that the individual had zero past history involving similar medical episodes, and/or that the individual had no reason to believe that he or she may be at risk of having a heart attack, a successful “inevitable accident” defence may be made out. This essentially results in the injured party being unable to recover any damages from that individual or his or her insurance company, despite there being potentially very serious injuries. 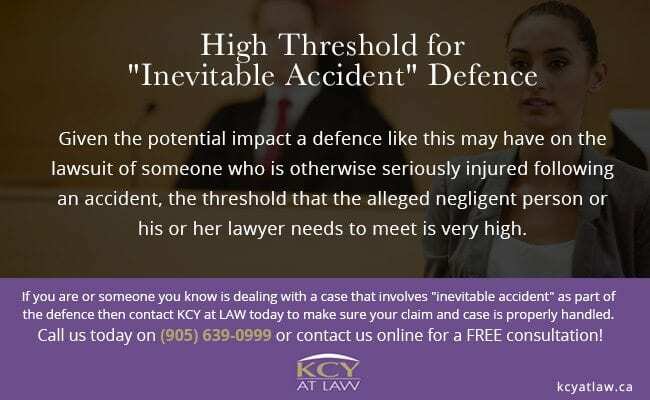 Given the potential impact a defence like this may have on the lawsuit of someone who is otherwise seriously injured following an accident, the threshold that the alleged negligent person or his or her lawyer needs to meet is very high. Cases involving the defence of “inevitable accident” or “Act of God” can be very complicated and many of them often involve the hiring experts to opine on the inevitability aspect of the defence. In the case of a medical episode for example, this may mean combing through countless medical records of the alleged negligent party to determine whether there was any indicator that said episode could result. 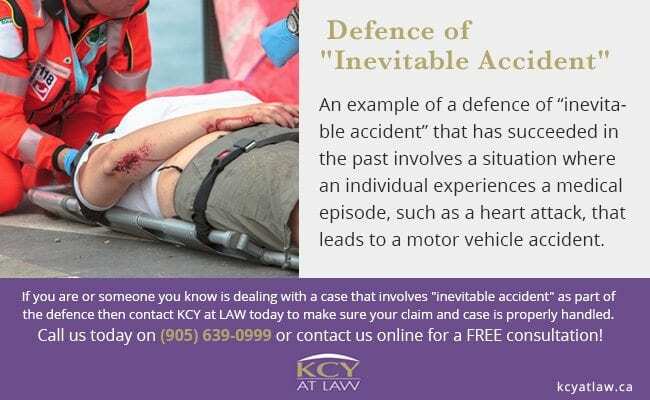 If you are or someone you know is dealing with a case that involves “inevitable accident” as part of the defence then contact KCY at LAW today to make sure your claim and case is properly handled. Call us today on (905) 639-0999 or contact us online for a FREE consultation!